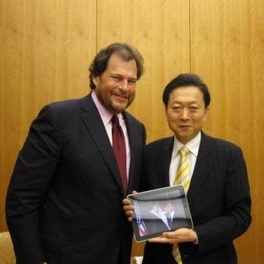 Editor’s note: Marc Benioff, chairman and CEO of salesforce.com, really loves Japan. And if you are a startup founder or tech executive, he thinks you should too. He explains why in this guest post, culled from observations from his most recent visit. Thousands of people lined up last week to buy iPads. And, if you didn’t notice them, it’s because they were in Tokyo. I’ve been living in Japan for the past three weeks and couldn’t miss the madness around the introduction of the iPad here. I couldn’t believe the demand for this new “magical” computer. After all, this is the country that developed and built some of the world’s most popular PCs—and now the iPad, which was designed somewhere else, is revered. It’s bowed to. (Reportedly, about half of Japanese business and technology magazines are featuring the iPad on their covers.) I expect that out of the 10 million iPads sold this year, at least 500,000 to one million will be sold in Japan. Something else amazing in Apple-mania happened last week. 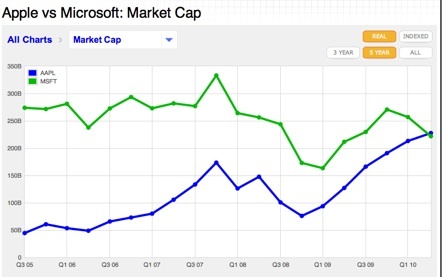 Apple’s market cap passed Microsoft. I suggested in a post last April, “The end of Microsoft. A door opens to a new cloud”, that this seminal event was about to happen. Steve Jobs described it as being “Surreal”. I agree. It is surreal—both unbelievable and fantastic. This is a milestone that signifies a dramatic change of computing: Windows is on the decline, and new technologies such as iPads and iPhones, Android and Google Search, and Cloud Computing are on the way up. I have to admit, I love Japan. I love the people, the culture, the language, the architecture, the food—everything. I love walking through the temples and gardens in Kyoto. 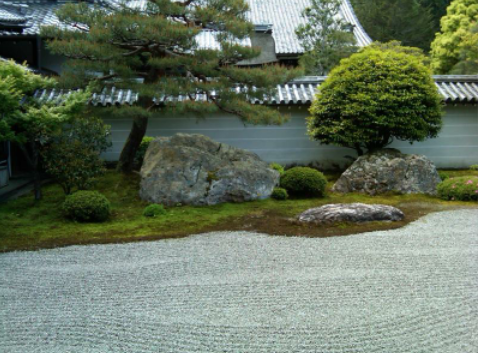 And, I love the philosophy of “Zen.” I love working in Tokyo, which runs at a frenetic charge that’s even higher than New York City. The reason I’ve been spending so much time in Japan is because it has become salesforce.com’s second largest market. We’ve found that the Japanese love Cloud Computing because it gives them great software that is eco-friendly, equal for all businesses, and upgrade-free. When I was at Oracle, Japanese customers were always waiting for our special “J” products (the port of our English versions), or the bug fix of a “J” port. It was often a long and painful wait. Cloud Computing solves all of these problems, and Japanese customers receive new software on day one, as well as bug fixes as they happen. Instant gratification. One of the things that captivated my attention in Japan was how utterly swept the country is with social networking—there is a Japanese Facebook Imperative underway. Japan is already one of Twitter’s largest markets, and local social vendors like Mixi are pervasive. Japanese customers have easily and rapidly adopted social networking as it is highly compatible with their community-based culture. Japan, more than any other country, is ready to accelerate social networking with mobile. The wide penetration of 3G will be an engine for this movement. In fact, Japan has the highest percentage market penetration of 3G of any country, according to InfoCom. The combination of dominant social market share and broadband wireless is a powerful catalyst for Japan’s IT industry. In my own personal experience here, I’ve seen this willingness to embrace social communications firsthand. Over the past few weeks of demonstrating Salesforce Chatter, salesforce.com’s new enterprise social networking service, I was amazed to find that Japanese customers made unusually quick decisions to pursue it. Customers in other parts of the world (including the U.S.) have required a great deal of testing and evaluation. But in Japan there was an innate understanding of our app to be a Twitter or Mixi for the enterprise, which translated seamlessly—and drove adoption. This experience inspired me to think about what I call “Social Intelligence,” an idea I believe will launch us past business intelligence as the next major theme in enterprise computing. In Tokyo I enjoyed dinner with one of my friends, John Hinshaw, the global CIO of Boeing. I already knew Boeing is preparing to release the Dreamliner, the most advanced airplane in the world. But, I didn’t know that 35% of the Dreamliner is manufactured in Japan. In fact, the entire all-composite wing—the first of its size and sure to set the standard for how commercial airplanes will be made—is made by Mitsubishi Heavy Industries in Nagoya. Each 98-foot long wing is then airlifted to Washington for assembly in Boeing’s special cargo plane, “the Dreamlifter”. If you aren’t sold on Japan’s abilities for the complex yet, consider that Japan also leads the world in energy and environmental patents and it is also the global leader in energy research and development expenditure and efficiency. I can certainly understand why Boeing is also focused on Japan. When you get an iPad, the new iPhone 4, or iPod you can’t miss seeing “designed by Apple in California”—the tagline that has generated heat from critics who get upset because the device is assembled in China. But what most people don’t recognize is that the parts are made all over the world, with some of the most important components being produced in Japan, Korea, and Taiwan. Take the iPod Nano. The flash memory is made by Toshiba, the Li-Ion battery is made by Sanyo and Sony, and the color LCD is made by Sharp, Toshiba, and Matsushita—making the total of the Japanese share in terms of cost 81%. The reality is the iPod is made possible by some of the most important technology in the world—and a lot of it is from Japan. Even 10% of the iPad comes from Japan (the rest is made by Taiwanese and Korean manufacturers). Japan is one of the countries doing some of the most exciting research and development in the most complex components, which is what drives the most compelling products. While in Japan I learned that Japan’s political and technology leaders recognize that embracing new technology and developing fundamental infrastructure are at the core of this country. Anyone who has experienced the bullet train, driven on Japan’s highways, or made a cell phone call in Tokyo, knows Japan fully commits to these two tenets. Cloud Computing is viewed as a critical next step for Japan, and it is the fastest growing part of Japan’s IT industry. Japan is always focused on getting the next big thing right. (And it usually does. I think the energy around the iPad last week demonstrates that they’re ready for Cloud 2—the next transformation in computing being defined by cloud + social + iPad. One of the greatest surprises during my trip was that then-Prime Minister Hatoyama requested a meeting with me. I spent almost an hour with him demonstrating the power of Cloud Computing in Japan. Then he had a final meeting with the Chinese President. And, then he resigned. Why would he care so much about the Cloud to spend some of his final moments in office with me? I think he realized that he needed to send a clear signal that this new technology is pivotal to the future of Japan. Right before I left Tokyo for home I met with John Roos, the new United States Ambassador to Japan. John is the former CEO of Wilson Sonsini, and is a Bay Area native. Interestingly, he had never been to Japan before being nominated to his position. He asked me why more entrepreneurs in the U.S. weren’t focused on the amazing markets in Japan. I told him that although the Japanese IT market is the second largest in the world, it’s notoriously difficult for many Americans to navigate. I am grateful to my Japan guru, Larry Ellison, with whom I was fortunate enough to experience many trips to this country while I worked at Oracle for 13 years. If it wasn’t for that direct education, I don’t think salesforce.com would be as successful as it is here. Japan is accessible through several non-stop flights from San Francisco every day. And while the Japanese market and Japanese customers wait for the arrival of the next great thing, most entrepreneurs, and even VC firms, focus instead on China and India. I have never understood why, as China and India represent a market that is an order of magnitude smaller than Japan when it comes to key technologies, like software. Sure, India and China are fast-growing markets, but the current buyers are in Japan. The way I see it: If you are overlooking Japan you might as well overlook the West Coast of the U.S. The Japanese city of Osaka has a bigger economy than the state of California. As the second largest IT market outside of the US, the reality is Japan still matters. The world is changing profoundly (just look at my favorite Apple vs. Microsoft market cap chart), but there are some traditional and established entities that retain a significant influence. Entrepreneurs should take note that 85% of all enterprise software is still essentially bought in three core markets: the U.S., Japan, and the U.K. Ignoring Japan means ignoring one of the most important opportunities. And, if you need a hand in this market, come with me on my next trip. I can’t wait to get back.